Pictured: Fifth year students Toni Mockler, Nicole Gaynor Meier and Kyle Graham from Ringsend College who were awarded third place (Senior group) with teacher James O’Keefe. If you were ever worried about what’s in store for the next generation, a trip to BT Young Scientist and Technology Exhibition (BTYSE) in the RDS at the start of the year would have put your mind at ease. The BTYSE had received its highest amount of entries since its inception 53 years ago and the entrants that were awarded stands at the exhibition were kept busy, putting in full-day shifts of presentations and answering questions from as many as they could from over 50,000 attendees over the three days. 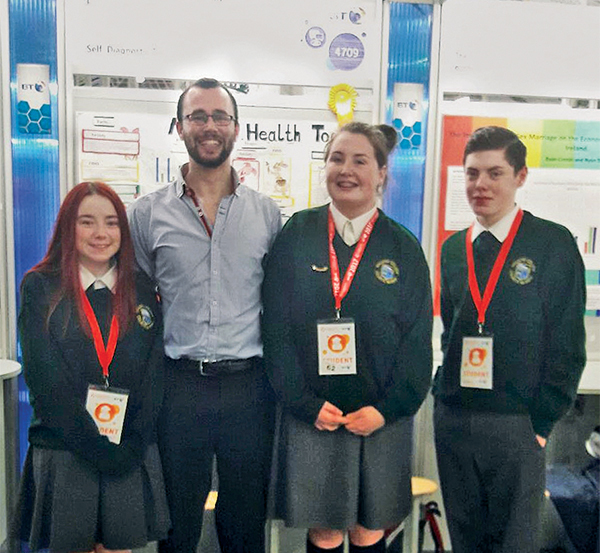 Both schools from Dublin 4 that were awarded a place at the BTYSE this year competed in the Social and Behavioural Sciences category. 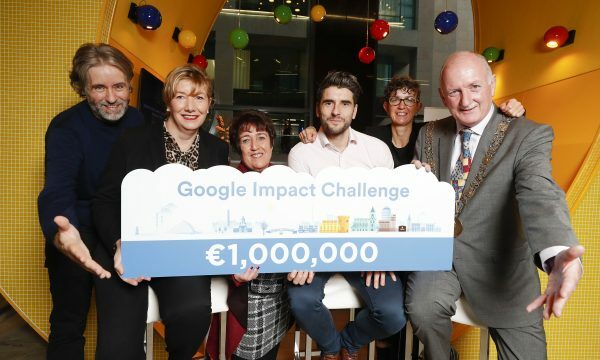 Fifth year students Toni Mockler, Nicole Gaynor Meier and Kyle Graham from Ringsend College were awarded third place (Senior group) for their project, A Self Diagnostic Tool – an app designed to help people with anxiety, depression, eating disorder and other mental health issues. The project, which required reading through peer-reviewed articles and medical journals and learning coding with HTML, culminated in an app for your device that comes in two parts. 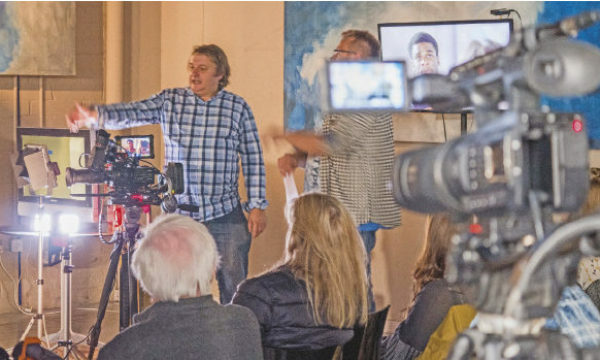 “The first part is a questionnaire touching key subjects on mental health and the second directs you, depending on your score, to the help and support you need,” their teacher James O’Keefe told NewsFour. “These journals were intimidating to read and we wanted to take out the important information and re-articulate it to make it more accessible for people our age,” said Toni Mockler. Things are looking positive for the project, as Pieta House are wishing to endorse the app and the Education and Training Board for Ireland (ETB) are interested in using the app’s re-articulated phrasing of medical jargon for their own literature. NewsFour caught up with another local school which made it into the social and behavioural science category. 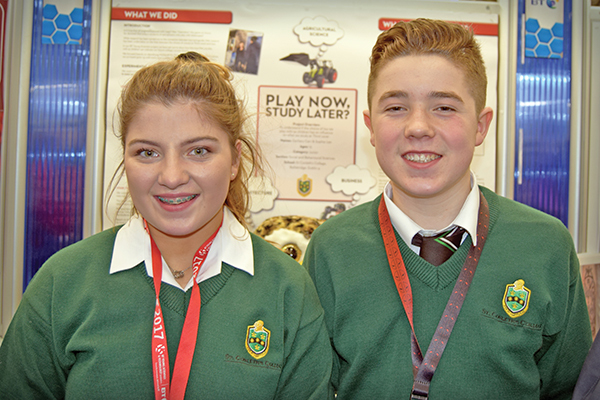 Second year students Zachary Carr and Sophie Lee from St. Conleth’s College, Ballsbridge were highly commended for their project – Play Now, Study Later – which investigated the connection between the type of toy a child plays with when young and the career path they choose when older. Carr and Lee told NewsFour that they went to UCD to find out if there was any co-relation by asking students on campus. 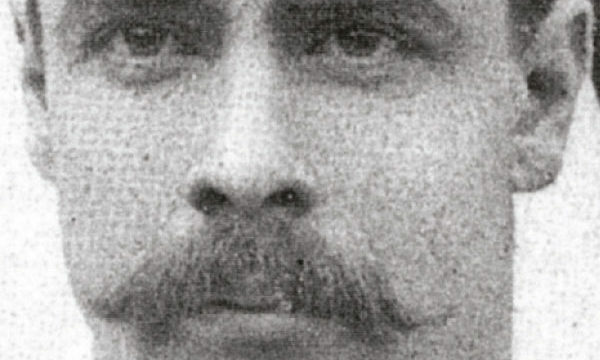 “We found a large percentage of the agricultural students did play with trucks and diggers when younger,” Carr told NewsFour. Pictured: Second year students Sophie Lee and Zachary Carr from St. Conleth’s College, Ballsbridge. Although there were no awards for the Primary Schools fair, the students here were proud of their work, to the extent that they were parading the area asking attendees to come and see their projects. 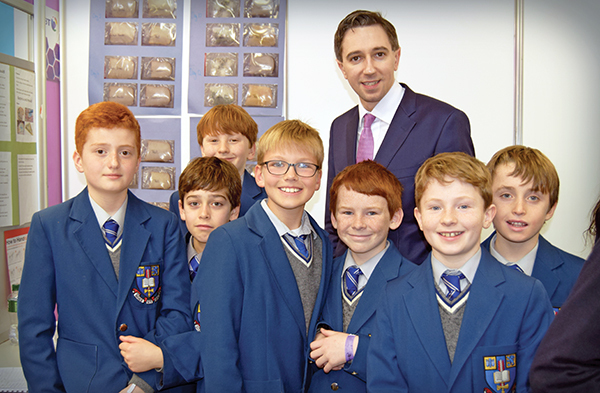 Pictured: Sixth class students of St. Matthew’s Sandymount with Minister for Health Simon Harris. 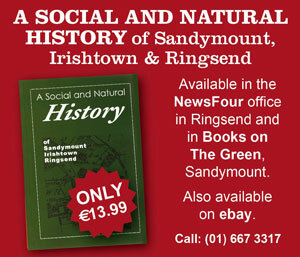 Dunne told NewsFour that they originally had an idea from each member of the 28-pupil class and voted it down to the one chosen and that they used other students in the school, while on their lunch break, and discovered the hypothesis to be true. St Michael’s Junior College, Ballsbridge, fourth form students, along with teacher Enda Ruane, showcased their project, ‘How dirty are our hands?’ One of the students involved, John Tripp, explained the experiment to NewsFour which involved two tests on bread, one touched with hands pre-cleaned with sanitizer and one without. Tripp told NewsFour that both breads were placed into sealed transparent bags and left over a number of weeks. Amazingly, the bread that was touched with the sanitized hands had no mould four weeks after being touched and the one without sanitizer went bad after a number of days. Tripp told NewsFour that the idea here was to have hand sanitizer in each classroom and he had a petition for people to sign, which was already four pages full. NewsFour would like to congratulate all of those students who entered and for their interest in changing our world for the better.